European stock markets opened with more losses, but are moving upward again as traders expect a strong US opening. Traders will be hoping that this afternoon's European resurgence marks the end of a rotten phase for the world's markets. THE ONGOING TUMULT on the stock markets has shown signs of coming to an end, as the main European indexes headed towards lunch hour having reversed massive early losses. Having fallen 3.7 per cent a few hours into trading, the FTSE 100 index had surpassed its opening value shortly after 12:30pm and seemed set to end a record-breaking streak of heavy consecutive losses. The London markets, which had been sent into a selling spiral by the ongoing riots across England as well as the more shaky global environment, appeared to be soothed by David Cameron’s speech promising a decisive clampdown on the spate of lootings which have dented hopes of a consumer rebound. Dublin’s ISEQ index, which had initially opened in positive territory before following its European counterparts into the red – at one stage showing a 2.5 per cent loss – had also managed to revive its fortunes before lunch by recording more gains. By 12:45pm it was showing a rise of 1.3 per cent, and was set to end a torrid stretch of losses of its own. Among the positive movers in Dublin were CRH, up 4.2 per cent, the Grafton Group which was up 7.8 per cent, and Merrion Pharmaceutical which reversed massive losses yesterday by rising 4.4 per cent. In Paris, the CAC 40 was up by 0.6 per cent – having earlier lost 4.4 per cent. Frankfurt was also edging close to positive territory by lunchtime – having shed a whopping 8.7 per cent less than two hours into trading. It also appeared that the new positivity would spread to the US – with futures markets showing that the Dow Jones was set to gain 1.6 per cent on opening, the S&P 500 on course to gain 1.9 per cent, and the NASDAQ to rise by over 2 per cent. Aside from Cameron’s speech, the resurgence may also have been sparked by rumours that US federal reserve chairman Ben Bernanke was set to make a statement before US markets opened. Closer to home, the ECB’s measures to buy bonds of Spanish and Italian economies also seemed to be paying off: the Spanish 10-year government bond yield had dropped to just over 5 per cent by lunchtime, while Italy would pay 5.12 per cent for a 10-year loan of its own – down from 6.4 per cent last Friday. Those moves had hit Germany and France, however: those two countries both saw their cost of borrowing rise slightly as investors showed caution at the prospect of those governments having to take a more active role in saving the Euro, which was up moderately against the pound and dollar. Market news was less positive earlier, with the Egyptian stock market being suspended for 30 minutes after recording a five-per-cent loss. Email “Is this the bottom? Europe reverses early losses as markets turn green”. Feedback on “Is this the bottom? 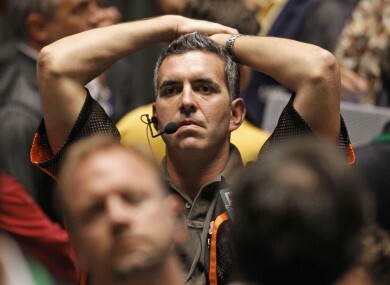 Europe reverses early losses as markets turn green”.